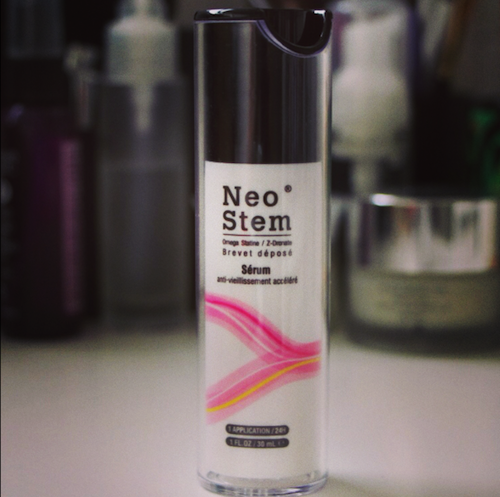 Reader Giveaway: 10 Bottles of NeoSTEM Super-Serum! I have ten bottles of NeoSTEM Anti-Accelerated Ageing Serum to give away to my readers. This super-serum has been formulated to counteract the signs of premature ageing and especially skin that has become less dense and plump. The leaflet that comes in the serum’s packaging goes into quite a lot of detail about how the product works, but in a nutshell; two active ingredients work together to stimulate collagen synthesis for stronger, rejuvenated skin. Sound good? I’ve only been testing it for two weeks or so but I have to say that it’s definitely doing a bit of plumping, and I can also feel a difference in hydration. A quick skim of reviews online show very good feedback and the double-blind testing that NeoSTEM carried out prior to launch is pretty impressive. Winners of the serums are very welcome to let us know how they get on with theirs – I love a bit of reader feedback! I’d say that the target audience for this product is going to be people in their thirties upwards – “hollow cheeks” are mentioned quite a lot, and you don’t really start to lose plumpness that radically until later on in life. But for a fresher and more dewy complexion then I suppose you could really use this at any age – though children and pregnant or breastfeeding women should avoid. Leave your comment before 12 noon (BST) on Friday 16th August and ten winners will be picked at random. I’ll announce them in the Sunday Tittle Tattle – please make sure you check back! One entry per person, please, and no crying if you don’t win. Them’s the rules.